Furthermore, at SWRB, we strive to use as much of the proceeds from sales, as is possible, to produce more free and discounted Puritan books, Reformation MP3s and Calvinistic videos. This is how, by God's grace, we have published so many books, MP3s and videos over the years (with a relatively small staff and the help of volunteers) and why we are able to distribute so much material for free and at such low prices - may our Lord get all the glory! With your continued prayers, support and purchases we will be able to reach even more people, in the future, all around the world with the truth of the Scriptures - using the latest and best technologies available, in the service of the Lord, to greatly multiply all the good that can be done, and aiming to fill the world with the best Christian resources available (Acts 17:6). Below are nine of the 140 or so Web sites/pages we use to disseminate free Puritan books, Reformation MP3s, and Calvinistic videos. 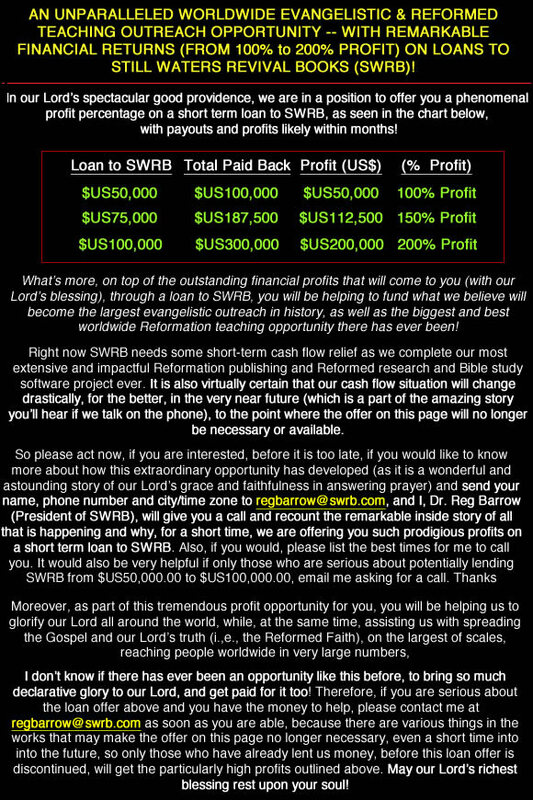 Past SWRB Emails With A Massive Number Links To Free Puritan and Reformed MP3s, Videos, Books, etc. FREE PURITAN HARD DRIVE SOFTWARE (This free demo version contains over 300 free Reformation resources and the world-class software found on the Puritan Hard Drive). With your continued prayers, support and purchases we will be able to reach even more people, in the future, all around the world with the truth of the Scriptures - using the latest and best technologies available, in the service of the Lord, to greatly multiply all the good that can be done, and aiming to fill the world with the best Christian (Puritan and Reformed) resources available (Acts 17:6). Also, if you would like to volunteer some of your time to read Reformation and Puritan books to MP3, you will not only be being used of the Lord to make permanent digital audio versions of the best Reformed and Puritan books, but we will also list these Reformed and Puritan book readings on the Web, to give them away for free to people in every nation of the world! You may listen to samples of other readings at Free Puritan & Reformation MP3 Audio Sermons/Books, and at http://www.sermonaudio.com/swrb,and it is very easy to get started, just email us at swrb@swrb.com requesting our "PURITAN and REFORMED BOOK READER" instructions and we will email these you as soon as possible. Below you will find a number of Puritan and Reformed books, sermons and articles that we are offering as free digital downloads (Matthew 10:8). Please click on the title to initiate an immediate download to your computer. Many more free Reformation resources are forthcoming, so check back often.